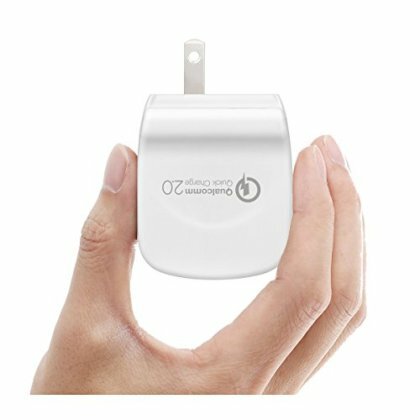 [Qualcomm Certified] Qi-Infinity™ Quick Charge 2.0 USB Turbo AC Wall Charger (18 Watts) - Supports iPad Charging too! Smart and rapid charging, it takes only 30 minutes to charge 60% of Samsung S6 or 75% faster than conventional USB charger. This is the only product currently available on Amazon that supports Apple products like iPad too (2.1 A current). Special design with replaceable plugs for different countries. Worldwide 100-240V AC input, suitable for traveling. Universal charger with 5V/3A, 9V/1.67A, 12V/1.2A with newest IQ power chip can support non QC 2.0 devices as well. Max 3A output current that also support fast charging for iPad. Multiple built-in safeguards fully protect against Overcurrent, Overcharging and Overheating for safe and fast charging. Note: Backward compatible with non QC 2.0 phones as well. Package includes: Quick Charge 2.0 Wall Charger, User Manual and full 12 Months Worry-Free Warranty.